Tower is the house-brand of photo equipment for Sears & Roebuck. The equipment is identical to the famous-maker-brand versions, but you have to be able to recognize the maker's model to know who made it. But in a few cases, it appears that things were made exclusively for Sears, and this meter seems to be one of them. I believe this was manufactured by G-M Labs, partly because of their long prior association with Sears, and largely because if you remove the front cover, there's a Patent # on the face (below where it says "Light Level." It's not visible with the cover on), and the patent # goes to a 1939 G-M patent for their Standard and Skan meters. 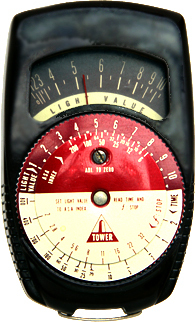 This is identical to the standard Tower Exposure Meter from around 1952, except that they changed the calculator dial and the film speed list on the back. Color film had been around since the 1930s, but in the 50s the price had come down to where amateurs could start seriously affording it. You didn't need a new light meter for it, but some manufacturers implied that they had special color meters. The Norwood Director Model D was a Color-Matic, and had a special readout if you were using Kodachrome 10. In this case, there's nothing really new or special about any of it. You read the light value the needle points to, and on the top of the calculator dial, you match that up against the ASA film speed you're using. So if the meter points to 6, and you're using Ektachrome 32, the combinations are 1/200th at ƒ/2.8, 1/100th at ƒ/4, 1/50th at ƒ/5.6, 1/125th at ƒ/8, and so forth. Mine arrived with the needle's frozen. If you want to see its innards, visit my autopsy page.